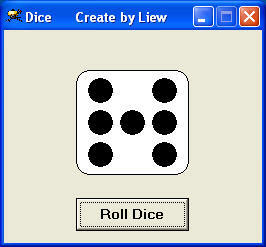 This program creates a die which can be used to play board games. It can also be incorporated into VB games that require a dice. VB games that you can create in Visual Basic are step and ladder game, monopoly and more. First of all, you draw a rounded square in the project windows. Secondly, you need to draw an array of 7 dots and VB will automatically labeled them as shape1(0), shape1(1),shape1(2), shape1(3), shape1(4), shape1(5) and shape1(6). You can control the appearance of the dots using the random function RND.